Apple's iPad turns 5: Has it lived up to Steve Jobs' 2010 keynote? The iPad Is 5 Years Old Today. You Still Don’t Need One. 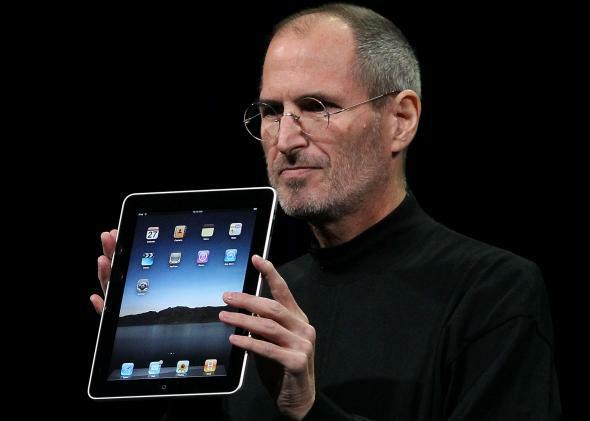 Steve Jobs set a high bar for the iPad when he announced it on Jan. 27, 2010. It has never quite cleared it. All of us use laptops and smartphones now. And the question has arisen lately: “Is there room for a third category of device in the middle? Something that’s between a laptop and a smartphone?” … In order to really create a new category of devices, those devices are going to have to be far better at doing some key tasks—better than the laptop, better than the smartphone. Five years on, it might seem that Jobs was right. By most standards, the iPad has been a success, and the tablet has indeed emerged as a third category of computing device. And so today has brought some mea culpas from tech bloggers who had publicly doubted the iPad upon its unveiling. The most thoughtful of these may be Timothy B. Lee’s post on Vox: “Tech pundits like me hated the iPad—and that’s exactly why it worked.” Lee points out that the iPad was never aimed at “power users” who spent all day on computers and demanded powerful productivity features. Rather, it perfectly pitched to “ordinary users” more interested in casually consuming Internet content than creating it. There’s another way of looking at this, however. Yes, Jobs was right about what the iPad would need to do in order to succeed. He was right to leave out the productivity features and go big on the simple tactile pleasure of holding the Internet in your hands. But for all its popularity and appeal, the iPad never has quite cleared the bar he set for it, which was to be “far better” at some key tasks than a laptop or a smartphone. Is an iPad “far better” than a smartphone for reading or doing email on the go? It may have been when it was released. But smartphones have come a long way. The iPhone 6 and 6 Plus and their Android equivalents are now convenient enough for most mobile computing tasks that there’s no need to carry around a tablet as well. Is an iPad “far better” than a laptop for watching a movie or browsing the Web on your couch? Not if you have a MacBook Air, or a Chromebook for that matter. And it’s clunkier than either of those when it comes to things like email that require the use of a keypad. To slightly twist Jobs’ jab at netbooks, iPads today aren’t “far better” than other categories of devices at anything—they’re mostly just bigger smartphones. I’m not saying that the iPad was a failure, or that it doesn’t have its uses. I have an iPad Air 2 and my wife has an iPad Mini, and we both use them. I prop mine on the counter to watch SportsCenter while I do the dishes. She uses hers to check email and the weather and read the New York Times while she eats breakfast. In general, tablets are nice for doing things while you’re also doing other things, which is why they’ve also found important niches in the workplace. They’re also great for entertaining kids who can’t be trusted with something as important as your phone or laptop. But two other companies have actually pushed tablets further in these directions than Apple has. Microsoft’s Surface Pro 3 is better optimized for work. And Amazon’s Fire HD Kids’ Edition, with its low price, thick rubber case, and lifetime “no-questions-asked” return policy, is the smarter choice for a children’s toy. The iPad remains an impressive machine. But it also remains a luxury item rather than a necessity. Again, by most standards, it is a major success. Just not by the high standards that Jobs himself set for it five years ago. Update, Jan. 27, 2015: More evidence that the iPad has reached a plateau: Apple reported on Tuesday that it sold 21.4 million tablets last quarter. That’s about a 20 percent drop from the same quarter last year. And it came at the same time that Apple was reporting record iPhone sales of 74.5 million.